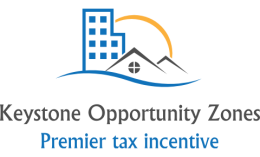 The Keystone Opportunity Zone is a premier tax incentive and provides companies and investors a unique opportunity to develop land with greatly reduced to no state and local taxes, a result of partnerships among state and local taxing bodies, school districts, economic development agencies and community-based organizations. 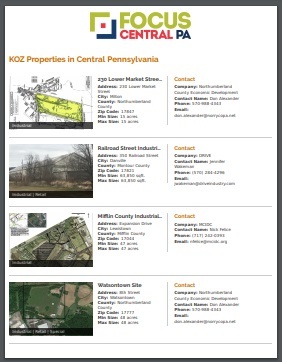 Click here for an interactive map of 17 available KOZ properties in Central Pennsylvania. The message is clear, these communities want to see quality companies providing smart economic opportunities and growth! Click here for a printable PDF of all KOZ properties in Central Pennsylvania. Keystone Opportunity Zones (KOZs) are areas designated by the local taxing bodies including the municipality, county, and school district, all passing a resolution designate a property for a KOZ, and then final approval by the Commonwealth of Pennsylvania that would benefit from additional investment. Businesses that make investments in these designated areas are eligible to be exempt from most state and local business taxes for a designated amount of time, some extended until 2028. The Pennsylvania Department of Community & Economic Development manages this program and a regional coordinator is designated to provide answers and information. What taxes are waived or reduced? State corporate net income tax. State sales and use tax. Local earned income/net profits tax. Local business gross receipts, business occupancy, business privilege and mercantile tax. Local sales and use tax. Your business or property must be located in a Keystone Opportunity Zone (KOZ) to be eligible for KOZ incentives. Contact the property contact or the regional KOZ coordinator with any questions or requests for information. Click on the brochure image above or this link to view a list of designated Keystone Opportunity Zone properties in Central Pennsylvania.